Teton Transportation, Inc. was founded as a small company with big ideas. Our viewpoint was simple: treat our employees as partners and surround ourselves with the best people possible. Teton has maintained a belief that if you have enough good people working together, something good will always happen. Striving to do our very best for each customer is a discipline that has driven our company to the success that we enjoy today. We conduct our business with honesty and integrity. We have a firm belief that the mark of a good company is not whether you have problems, but how you deal with the problems. This basic, yet fundamental philosophy has enabled us to grow from one tractor in 1992 to over 200 hundred in 2009. We look forward to the future and will continue to seek out new ways to improve our performance and add value to our customers and our employees. To continue to improve through experienced management, effective communication, leading-edge technology, and relentless attention to the education of our work force! January 1992 Teton Motor Freight started by Larry and Doug Hammond. July 1994 Grew to 30 tractors while operating as fleet owners. 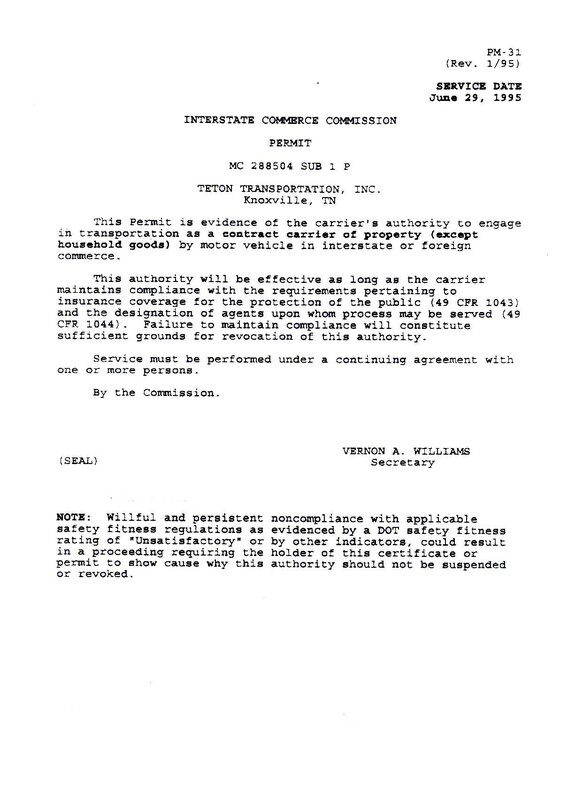 May 1995 Granted ICC authority to operate as Teton Transportation, Inc.
October 1996 Continued to grow through partnerships with our customers including SeaRay Boats. August 1997 Started specialized division hauling boats for SeaRay with 5 power units. December 1998 Teton continues aggressive growth pattern. Achieves $10m in sales, and 80 trucks. Specialized division grows to 30 units hauling boats. December 1999 Operating 137 trucks. Breaks ground for new corporate office and shop. Revenue approaches $15m. Specialized division up to 38 units. Instrumental in design and implementation of RGN (Removable Gooseneck Trailers) to increase diversity and opportunity Of shipments. December 2000 Operating 170 trucks. Added Super Yacht Fleet with expandable trailers. Revenue exceeds $19m. January 2001 to Present Annual growth of 30% with added equipment and customer base. Establishment of new divisions. Expansion with strategically located terminals.